Chicago’s more gluhwein than vin chaud and if you happen to go the Christkindl market downtown you’ll notice people drinking gluhwein out of small boot-shaped mugs. Not surprising given Chicago’s historic German population. However, I think vin chaud is better than gluhwein because it’s not a sticky sweet (and I do like gluhwein because, well, you get a boot mug!). With vin chaud you also taste more of the spices and even then the spice flavor is not overpowering. An orange slice and a little sugar added balances out the festive drink nicely. Another reason I’m now preferring vin chaud as my mulled drink of choice is the ease of making it. Put wine in sauce pan, add spices, some orange slices, bring to simmer, and voila! You’ve got vin chaud. 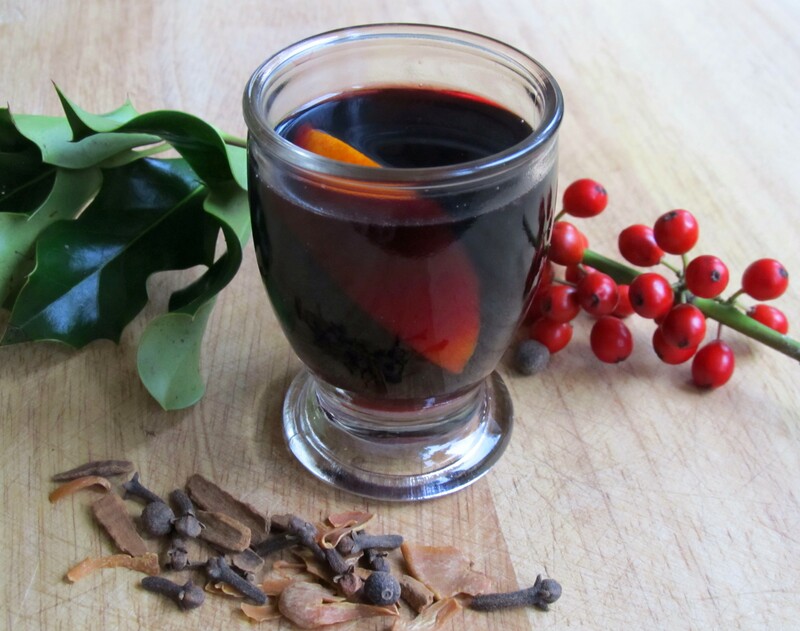 In doing my research I came across many many many different recipes, so as usual this is not the end-all be-all definitive recipe for vin chaud. And I know you were looking for it but my recipe does not have agave syrup in it (yes, I saw one with that ingredient). Anyway, the most common spices I saw included allspice berries, cloves, star anise, and cardamom seeds. I was surprised not to find much cinnamon or nutmeg but if you are using a mulling spice mix you’re going to end up with some and it’s ok. I did see one recipe which added some pear eau de vie which intrigued me but I couldn’t find any at our local liquor store. If you have some and would like to try it, add a ¼ C. Just keep the agave out. Because there’s no juice and sugar added, like when making gluhwein, the finished product tastes like…well…hot red wine with spices in it. Your mind definitely plays tricks on you here if you associate hot mulled wine with sweetness and your taste buds will tell you right away it could use some. When serving, garnish with an orange slice and sweeten with some sugar like you would a cup of tea. It’s a simple and delicious recipe for this time of year and I think will be a good hot drink to serve during the holidays over the next couple of weeks. Especially if you’re dealing with family. Rester calme et boire le vin chaud! Make sachet d’epices of the mulling spices. You can also just put them in the wine whole and strain out. Pour wine into a sauce pot, add spices and a few orange slices (if you have clementines slice one up for the pot and one for garnishing the drink) bring to simmer over medium heat. Pour into cup/mug and add an orange slice, sweeten with spoon-tip of sugar to taste, like you would to a cup of tea. Love vin chaud, I lived in Chicago and never had gluhwein, will have to look that up, If it’s terribly sweet I think I think the Vin Chaud would be my drink of choice, Sounds like the perfect winter warmer. See! Lots of sugar added. I think for gluhwein drinking it needs to be really cold, snowing, and you have to be wandering around an alpine village. I was just in NYC for 5 days and there was no mulled wine to be found. so silly. This sounds like a perfect recipe. I don’t like the sugar rush variety myself! That’s horrible! I didn’t find any in Montreal last weekend either. Yes, it’s much more mellow but still delicious.